Sharon P. Shea, an accountant in the Office of the Dean for Residence and Campus Activities, filed harassment and retaliation charges against MIT with the Massachusetts Commission Against Discrimination on Nov. 2. 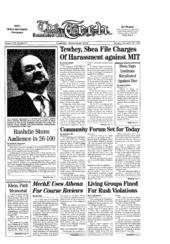 In her complaint filed with the MCAD, Shea said she had filed an internal MIT complaint of sexual harassment in June 1992 against James R. Tewhey, then associate dean for residence and campus activities. She also said that J. Paul Kirby '92, a former Undergraduate Association vice president, filed a harassment complaint against her on May 6, 1993. Kirby claimed that Shea spread rumors about Tewhey and himself. Shea alleges that MIT retaliated against her because of her complaint against Tewhey and Kirby's complaint. "The retaliatory situation at work was so unendurable that [it] created severe stress on my welfare. As of Sept. 10, 1993, I was authorized by my doctor to take a long-term medical leave," she wrote in her complaint. In the MCAD complaint, she claimed that she was also denied a promotion and had her duties limited. Institute officials have declined to comment on either complaint, but Provost Mark S. Wrighton said on April 26 that only one complaint was filed against Tewhey during his tenure at MIT, and that the complaint was without merit. MIT conducted an investigation of Kirby's complaint. In a letter to Kirby dated Aug. 26, Wrighton wrote that Frederick M. Lawrence, an associate professor of law at Boston University, had conducted an investigation of Kirby's complaint. Wrighton decided not to take any formal disciplinary action. "In view of Professor Lawrence's findings of fact I have decided that as far as MIT is concerned, no further action is called for in processing your grievance," Wrighton wrote. The letter continued, "Nonetheless, although there has been no violation of MIT policy established, there is in Professor Lawrence's finding the basis for me to conclude that poor judgment was displayed by Ms. Shea, such as by her contributing to the spread of unsubstantiated rumors about you and James Tewhey. I intend to communicate to Ms. Shea my concerns about her behavior in this respect." In her complaint, Shea said, "I was informed that my complaint [against Tewhey] was found unsubstantiated and that I was relieved of any and all liability." Kirby declined to comment on whether he would pursue his complaint further. "I don't think that anyone could find fault with the quality of the investigation, since it was conducted by a former federal prosecutor. But at this point, that's all anyone could say about the outcome of the grievance," he said. Tewhey said he had also filed a formal complaint at MIT against Shea because of rumors she spread about him. Tewhey said his complaint was not investigated.